With Elon Musk refusing to name any of the parties from whom he has allegedly "secured funding" after launching a huge short squeeze in Tesla yesterday with his now infamous Tesla "going private" series of tweets, it was only a matter of time before the regulators - who have so far stubbornly ignored Tesla - started asking questions. According to the WSJ, that time is now, because the SEC has inquired with Tesla about Elon Musk’s announcement that he may take the company private "and whether his claim was factual", or in other words, whether Musk lied when he said he had secured financing. The regulator also asked why the disclosure which kept people glued to twitter for hours was made on the social network rather than in a regulatory filing, and whether the firm believes the announcement complies with investor-protection rules. According to the WSJ, the SEC inquiries - which originated from its San Francisco office so it will be relatively easy to visit the Fremont office - suggest Tesla could come under an enforcement investigation if regulators develop evidence that Musk’s tweet was misleading or false. And while it is mostly semantics, so far it remains unclear if the SEC had opened a formal enforcement investigation based on the answers it received from the company. "To put that out unless he absolutely has financing secured and is ready to make the bid that could be market manipulation," Keith Higgins, a Ropes & Gray partner who formerly led the SEC’s corporation finance unit, told Bloomberg. "He could be in big trouble if that turns out not to have been true." The biggest risk for Musk is if regulators find that he made a statement only intending to goose his company’s share price, or as he likes to put it, "crush the shorts." Under US securities law, companies and corporate officers can (and will) be held liable for making misstatements or omitting information that shareholders need to make informed investment decisions. In his email to employees on Tuesday, instead of detailing the circumstances around the "pre-commited" going private deal, Musk blamed short sellers and other pressures public markets put on companies as factors in announcing he wanted to take the company private. 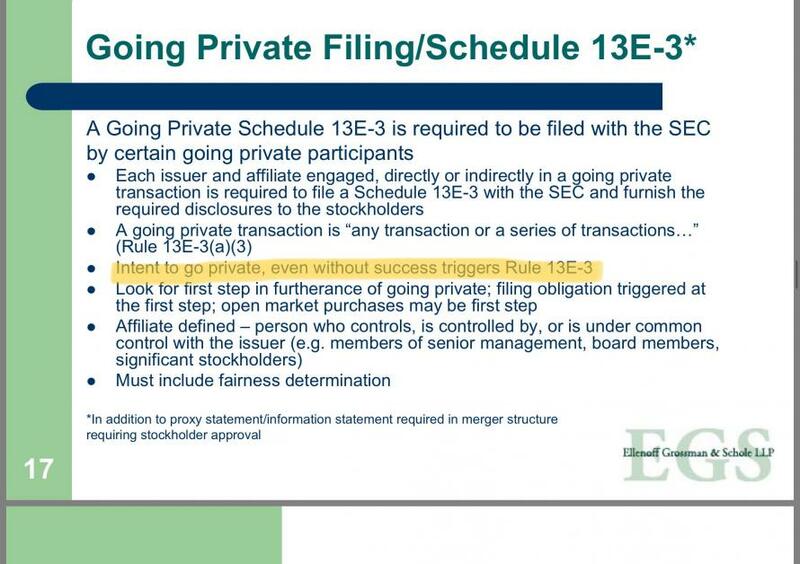 As we noted earlier, one potential problem is that merely the intent of a "going private" transaction, triggers rule 13E-3, which requires the company to file a Schedule 13E-3 with the SEC as well as furnish the required disclosures to the company's shareholders. Note: the rule is triggered in either case, even if the intent to go private is ultimately unsuccessful. 13E-3 or no, the SEC will demand to know just what is going on, what the Board knew and when - recall it stated today that it was made aware of Elon's plans last week and yet there was no mention of this in the 10-Q's "Recent Developments" section - and if Musk was even sober and rational when he tweeted what he did. Dear @SEC_News, this is an easy one: ask TSLA to show you the agreement(s) signed by their funding source(s) by 5pm EST that demonstrates the funding is “secured” and “certain.” If there is no such agreement, require a statement by 5:30pm. Inspire market confidence. And while Musk has historically been extremely cavalier with his tweeting, this time it could cost: if found guilty of stock fraud, he would surely be on the hook for billions as the lawsuits start piling in, with the worst case scenario giving Musk an unlimited amount of time to tweet to his heart's content... from prison. The stock dropped back under $370 on the news, and is rapidly approaching the $359.8676 conversion price of the $920 million of convertible bond due March 2019, which some have speculated is the entire reason behind the "going private" spectacle.